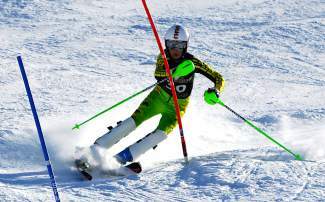 Battle Mountain High Schoolâs Matthew Glendining blasts through a gate during Fridayâs(Feb.12) high school slalom race in Steamboat Springs. The Steamboat meet wrapped up the high school regular season. Teams now head to the state meet next week.